Diamond Head Brian Tatler interview, April 2016. "'Am I Evil' has become a classic, and it’s certainly got a life of its own. Did I think people would still be listening to it thirty-five years later? Of course, no, is the short answer". - Brian Tatler. Hi Brian, how are you today? I’m very well, thank you, sir! 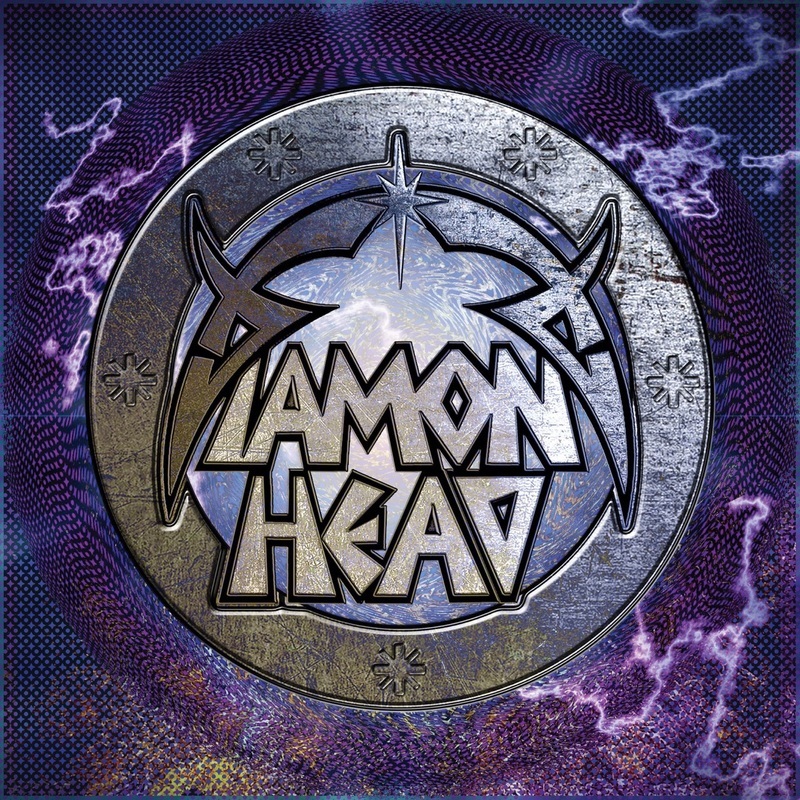 It’s been eight years since the last Diamond Head release. What led to the new album? Really, I think it was [new singer] Rasmus [Bom Andersen] joining. We did some dates and we all got on well, and I just thought that we should try and write together just to see if we could. Really, that was it, so I gave Rasmus a load of material we and picked out ones that we wanted to work on. I let Ras pretty much choose, because I thought; he’s got to sing on it, he’s got to put a melody line on top, and what I probably didn’t realise at the time, but by coming in fresh and just listening to the back catalogue, he’d got an overview of what works and what doesn’t work with Diamond Head. So almost like a producer would, he was able to pick out what sounds most like Diamond Head. As you say, it has been suggested that ‘Diamond Head’ is going back to the band’s ‘classic’ sound. With this album we had a brief where we thought; let’s try and make it sound like ‘Diamond Head’. I’ve never consciously done it before, but it seemed like the right thing to do this time. At least then, there’s a ‘style’ to it, there’s a starting point, rather than to just do anything you like. Once we kind of got that, we were off and running. It’s your first album with Ras, and you’ve credited him with renewing the energy in the band. Yeah, I think 100%. I think it’s given us a kick up the arse, if you like, to get it going again; get some new material, and take it further really. But fresh blood, I think it can very often do that to a band. In the past you’ve liked to experiment with the band’s sound, most famously on the ‘Canterbury’ album. Yes indeed. If anything, we experimented too much. I mean, it’s easy to say in hindsight, but we should have stuck a little bit more to our style. I think we found a style on ‘Lightning To The Nations’, and we moved on from it. I think bands need to be fairly consistent until at least they’ve achieved a big sales base and a big fan base, and then they can maybe experiment a bit and they can risk losing some fans. It was really timing, and it was almost as if we were experimenting out of control. If anything, we were being steered in the direction of trying to write hit singles, and that was probably a bad idea. We came up with things like ‘Call Me’, and ‘Waited Too Long’, and ‘Out Of Phase’, and no one really cared for those songs. They wanted ‘The Prince’ and ‘Am I Evil?’ and ‘It’s Electric’. None the less, ‘Canterbury’ is still as classic album in its own right. Do you think it was perhaps ahead of its time? It is a classic. I’ve seen it in the list of top ten greatest heavy metal albums of all time, and you think; well, it’s only sold two thousand copies, and it’s next to ‘Appetite For Destruction’, and ‘The Black Album’ or something. How is that possible?! It wasn’t a successful album, and we couldn’t even get a record deal with it. It became self-financed and we pressed two thousand copies that we sold at gigs. So it became a sort of ‘curio’, but in hindsight it’s become a classic album, and we had no idea at the time. Going back to the band’s early days, and history suggests that there were approaches made from labels and big name management that were nixed because of loyalty to Sean Harris’ mum, who co-managed the band. I think some of it’s true and some of it is exaggerated. Definitely, management was an issue, not only in that we didn’t have good management, but also that the management that we had didn’t want to let go of the band. Because of Sean’s loyalty to his mum, and his probable power in the Sean Harris household, I don’t think his mum was able to tell him what to do. He probably thought that if he did have somebody like Peter Mensch in charge, he’d have no choice. Ultimately, I think several things conspired against us. I’ve heard that Peter Mensch and Phonogram were going to sign one band; either Diamond Head and Def Leppard, and that they wanted to sign Diamond Head. I’ve heard that rumour. We supported AC/DC in 1980 on their last two ever gigs with Bon Scott, god bless him. AC/DC were managed by Peter Mensch, and he came backstage into our dressing room for a chat. How often does that happen?! How often does the manager of the main band come into your dressing room for a little chat? I think that was the moment he was coming to suss us out to see if he could work with these guys. And maybe he just though; “oh, okay, the mum’s involved, I’m not going to be able to pull Diamond Head away from the singer’s mum”- maybe that’s what happened. Maybe he thought that he could get Def Leppard away from their current managers because it wasn’t a blood tie, or perhaps he just thought Leppard would be easy guys to work with? Maybe he didn’t think we were ambitious enough? I really don’t know. One can only speculate. So there was more to it than simply poor management? I think so. I think Sean, for all his talent, you know, where is he now? There must have been something missing there, some kind of drive or ambition or ability to toe the line a little bit. As a side note, what was it like playing with AC/DC on what are now known as extremely significant dates? It was absolutely brilliant, because we were huge fans. Def Leppard had done the ‘Highway To Hell’ tour, but two of the dates had been rescheduled; Newcastle Mayfair, and Southampton Gaumont. Leppard couldn’t do them because I think they’d already started recording an album, so we’d got offered them, probably because Peter Mensch wanted to check us out. We met Bon, and we met all the boys in AC/DC. We sat and watched them both nights, and it was just great. What do you remember about meeting Bon Scott? I tell you what, he watched us from the side of the stage, and I remember our drummer saying he kept looking over, and there was Bon standing there with a bottle of Jack Daniel’s, as you do. And then when we came off, I’m pretty sure he said; “well done” and stuff, but he gave the bottle of Jack Daniels to our bass player Colin [Kimberley], who kept it. What do you make of the current AC/DC singer situation? Well I’ve read about Brian losing his hearing, and I’ve read the rumour about Axl Rose, and it’s peculiar. I don’t know, I mean, they’ve got to get somebody to finish the tour, and there aren’t many singers who could reach that range of ‘Back In Black’. So Axl probably could, but if it was down to me, I think I’d struggle to pick a suitable replacement. I suppose in a way, having somebody as famous as Axl would at least be kind of cool, credible, rather than, you know, ‘Joe Soap’ who sings in a tribute band or something. Back to Diamond Head, and Metallica’s patronage helped keep the band in the public conscience after the band split. Were you surprised by that? I met Lars when he was seventeen, before he was in a band, and he was a real big Diamond Head fan. He stayed with me, he stayed with Sean, and he wrote letters saying; “I’ve formed a band; it’s called ‘Metallica’”, and I just though; okay, that’s nice, Lars has got a band. But I didn’t think; “good god, this band’s going to be the biggest metal band of all time”! So they covered ‘Am I Evil?’ on the B side of ‘Creeping Death’ in 1984, and I was very flattered. We listened to and thought that they had done a very good job, working out the solo, and the arrangement was exactly the same. And they got bigger and bigger, and each time they covered another song it would blow my mind, really. I remember reading that ‘Master Of Puppets’ had sold a million copies in 1986, and I thought; they’re way bigger than Diamond Head ever were already, and they were only on their third album. We’ve stayed in touch, and I’ve stopped at his house a few times, and every time that they come to the U.K., he will call and say, “we’re playing tonight, do you want to be on the guest list”. You appeared with Metallica at the Milton Keynes Bowl in 1993, and released ‘Death and Progress’, but the band quickly dropped off the radar again. Do you feel like it was a missed opportunity? Sean had done an album with Robin George on a project called ‘Notorious’, and they’d spent about £400,000 making it. And then Sean decided he didn’t want to tour it. So the manager wanted to get Sean involved in something, and his obvious choice was perhaps he should do another Diamond Head Album, especially as Metallica were now conquering the world with ‘The Black Album’, and name-dropping us, in magazines everywhere. It was a no-brainer really, so Sean and I were put back together, but to him, it was really just another album where he could collect his advance [payment]. It took two years to record because that’s what Sean’s like, but it was meant to be polished off in six months. And then before the album was finished –we hadn’t even done all the vocals - Sean was off wanting to do his next album, and he was off concentrating on that. So the album got finished as best as it could by using some tracks that we’d abandoned, and a couple of tracks that we had earmarked for an EP. We had the Metallica show as a launch pad, but there was nothing booked after it, and the band just fell apart. You eventually stopped working with Sean Harris. I had to. In 2004 I had to get another singer. I couldn’t work with Sean anymore; I’d bent over backwards long enough. Life’s too short. I thought; we either try it with a different singer, or I’m going to go out of my mind here. So ever since then we’ve had a guy in the band who will say ‘yes’. You did work with Sean again at the Metallica 30th anniversary show in San Fransisco. Yeah, myself and Sean went over to play at the 30th anniversary concert in San Francisco. It was only one gig at the Forum. We all got the chance to rehearse in Metallica HQ, which was great – I’d never been to Metallica HQ. They look after you, they fly you out there and put you in a nice hotel and make sure you’ve got everything you want. What was it like having Sean sing on those songs again? Well, it was okay. Everything seemed a little bit fast, and I think Sean got out of breath quite quickly. But I’ve been playing constantly in one band or another, so I was fairly up to speed with the four songs, whereas Sean probably wasn’t because of course he’s not in Diamond Head anymore, and he doesn’t play any gigs, or he doesn’t release any albums. He just seems to continue to write for himself or something; I don’t understand his mentality. Back to the present day, and you’ve quite extensive touring coming up to support the new album. We’ve had longer tours, but we’ve got about probably twenty shows booked so far. We’ve got three shows for Ireland. We’ve been to Ireland a few times and we always have a good time. Finally, ‘Am I Evil?’ has taken on a life of its own outside of Diamond Head. Did you ever think that it would become the metal anthem that it has become? Well that’s very nice of you to say. It has become a classic, and it’s certainly got a life of its own. But of course, no, is the short answer. When we made that first album, we had no idea that that song was going to still be around and be talked about thirty-five years later. I’m just flattered that it is. It started out with that mighty verse riff; I came up with that riff probably in ’78 / ’79, and we spent over a year adding to it. We added the intro separately, we added the fast section, the solo, the end. We were getting good at putting together songs and arrangements, Sean and myself, and we did it all or organically really, just a band in a room with a cassette player. We’d record a section and we’d listen to it. It was quite an innocent way of working, but it turned into a beast of a track, and I suppose as soon as we started playing it live, people picked up on it. ‘Diamond Head’ is released 22nd April 2016 via Dissonance. The band’s tour begins in Swindon on the 22nd April. For a full list of dates visit Diamondhead.net.